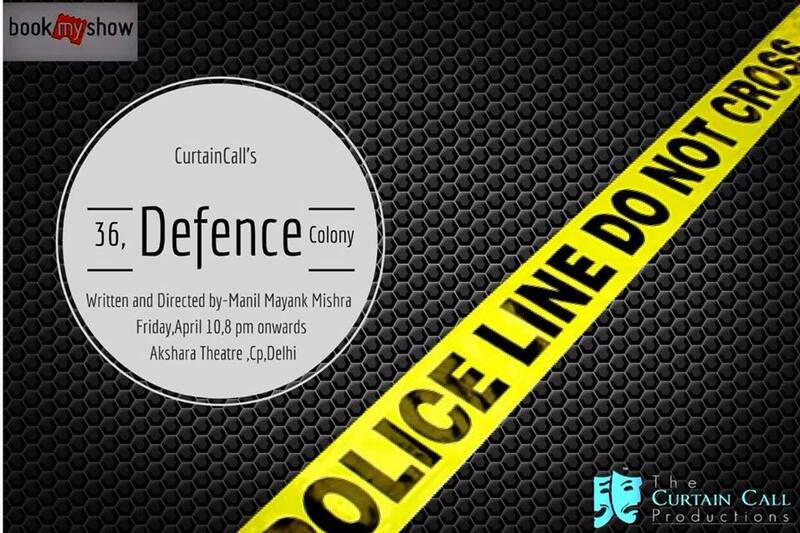 36, Defence Colony is not just an Address, It is also the Name of a Play which has now become Big Landmark in Indian Theater Scene. Written, Directed and also Enacted by Manil Mayank Mishra. Manil is friend and I’m a Fan of His Poetry, his Voice Modulation Skills and Choice of words even when he speaks casually. 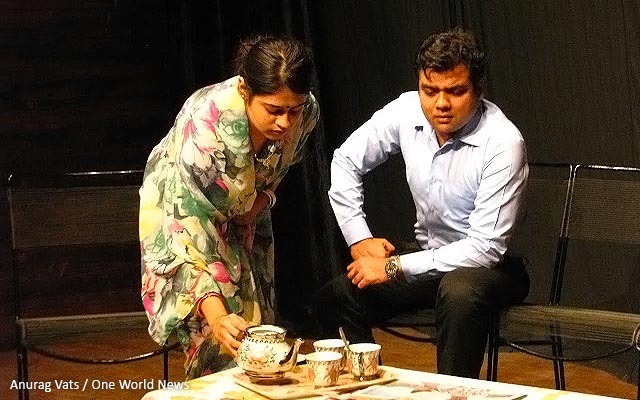 And when I got to know that he is the soul behind the Play, I promised myself not to miss it. As we slipped into small seats, “Heavy Weights” like me started complaining about the seat size, However that lasted for only a few minutes till the play started. Post that we got so engrossed in the play that nothing else than the play mattered or was even thought off. We got gripped from the very First Scene where an alleged Criminal accepts his wrong doings to the last scene where the Murder Mystery of Mrs. Savitri Dewan gets solved. In The Play Performances were Great, Storyline Gripping, Flow Flawless & all details very well taken care of. For Example, Some scenes which were not very core to the story were added so that it looked real like. The relation of Sub Inspector B.P. Jhakkar talking to his wife about “Metthi ke Poranthe & Pudina Chutney” and in scene Social message of “No Smoking” was passed mentioning about a Colleague’s Death and all Police Stations observing No Smoking day. Let us Talk about each Character separately. • Criminal- Played by Joshua Chin: The Character with minimum Dialogues but made for it with his Super Aggressive Performance. Though his Handcuffs came out inadvertently but he ensured that not many people could see it. • Sub Inspector B.P. 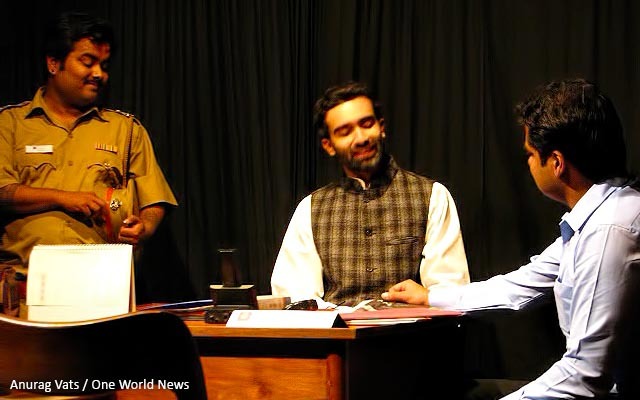 Jhakkar– Played by Nitin Mandal: He kept us smiling ear to ear and also added many giggles to the Play. One of the Strong Characters of the play whose Innocence and charm added lots of weight to the Play. His Relation with his wife (Via Phone) was perfectly displayed, as of any other Couple. He reminds me of Raja Babu, Govinda. 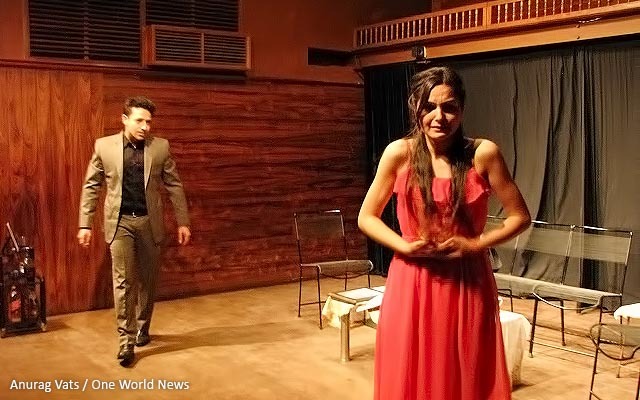 • Nishtha Dewan-Played by Radha Bhatt: Outstanding performance by all parameters. Her first scene was a real long one with some lengthy dialogues and many mood Swings including being Fearful, Sad, Strong and also lots of crying while remembering her mother. She pulled them awesomely. Even in the scene when she briefs her Husband about ACP’ visit is great as she acts as being on the verge of breakdown. That is exactly what was required knowing her Past and present State of mind. • Mr Samrat Dewan- Played by Akhil Vaid: Strong Body language, Great Voice Modulation, Extreme Panic Swings and the scene where he mockingly pacifies his Wife Nishtha while feeling her back was very strong. Here also detailing was taken care as he calls his wife NISHI, which is a nick name for Nistha. Very Real life like. 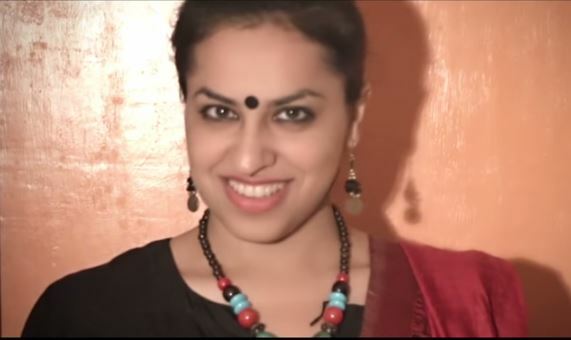 • Malini Awasthi- Played by Inderpreet Kaur: A Lady who talks less, but her body language says everything. Very Strong Character. Have to mention special care has been taken care of what Costumes each actor would wear. And Malini looks very Real in her Journalistic Salwar Kameez with Loud Makeup and Accessories. One scene of hers that brings smiles is when she asks ACP to not Smoke in front of her as she is trying to quit smoking and may get tempted seeing him smoking . Eventually on her way out she takes out her Pack of MORE Cigarettes and puffs while she exits the stage. • Maid- Played by Megha Ahuja: Her Rotating and revolving big Eyes did the magic for her in Initial scenes. And then also her Hands and shivering body in the last scene where she shares a First-Witness account with ACP. For Some actors Awesome is a Small word, She is one of them. • ACP Prakash Ahalawat-Played by Manil Mayank Mishra: The Character on whom the entire play rests. Barely was there a scene where his presence on stage was not required. He added a style where the ACP keeps using his tongue over his lips. Again detailing wins here. A Strong Thinking Character who does not jumps to conclusions and looks everything from a 360 degree Perspective. Manil has very well casted himself for this role. One would appreciate that being a Director as well as the Lead character is a BIG RISK. And this Risk paid the Rewards. One more reason for the success of the Play goes to awesome casting. Looked as if each character was written keeping that particular actor in mind. I hope and wish that 36, Defence Colony is repeated on a regular basis so that it could reach to more and more people so that the Brilliance and Effort of the cast & Crew is optimized to the maximum. Best Wishes to the TEAM. I’m a Fan for life. Delhi has always been a City where Poets got there due. Or was it Delhi that created Poets?? Delhi had so much Charm, So much of Character that some one who came to Delhi, never felt like going back. 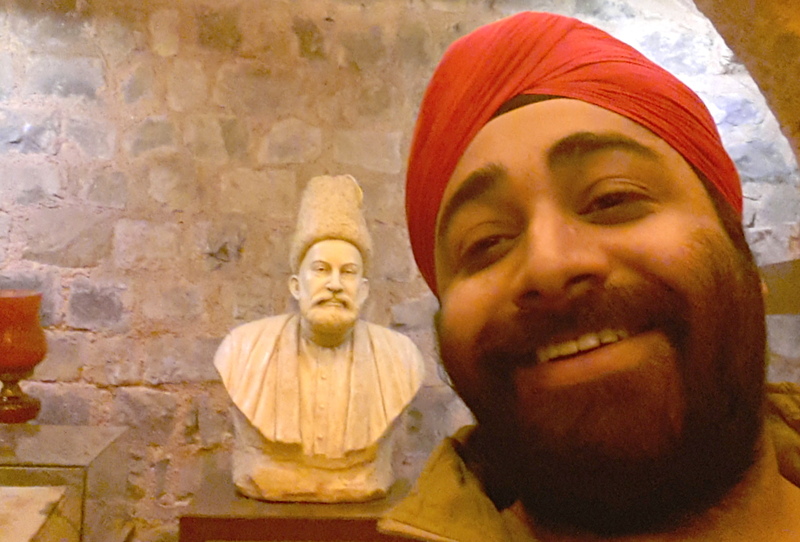 Be it Momin who Came from Kashmir, or Mir Taqi “Mir” who originally hailed from Agra or even Ghalib who was also called Naushe (Damaad/ Son-in-Law) Miyan as his wife hailed from Delhi. Once he came to Delhi, he never went back and his final resting place is near the Dargah of Hazrat Khwaja Sayed Nizamuddin Auliya. 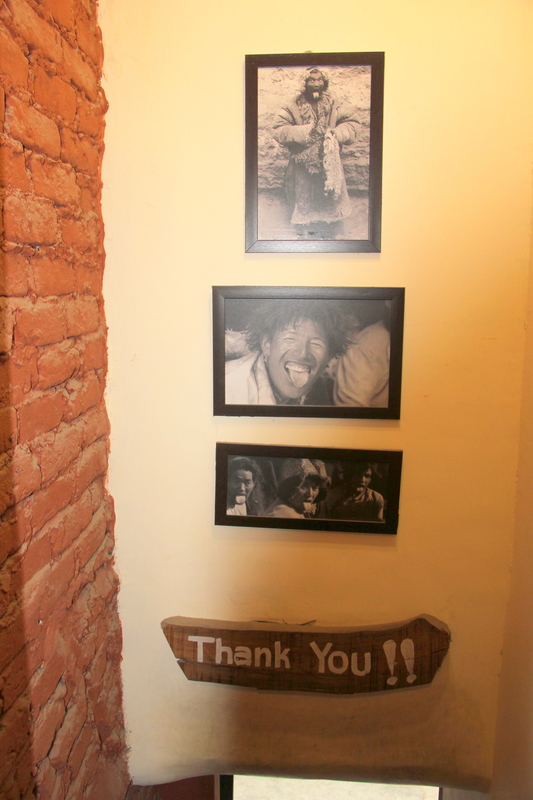 by a Writer and Poetess par excellence Ms. Saumya Kulshrestha. I love to have great heavy Breakfast and more Quainter the place, the more I love it. So When I got to know that there is an Eatlo Eatup at Cafe Ama in Majnu ka Tila area in Delhi, then me and Gurleen (I’m her Husband) decided to go for it. Though Gurleen had a meeting at 11am in North Delhi, she still insisted to be part of it. We went in a single car and decided that I shall take a Metro from Vishwa Vidhyalya Metro Station and come to office after changing the Train from Rajiv Chowk. The Meal was OK, the Place was Awesome and while we walked to our Car, I realized that Gurleen has a meeting in Shalimar Bagh. Shalimar Bagh is almost halfway to our home so decided that taking a Metro would take an Hour and Auto would not take more than 30 minutes. 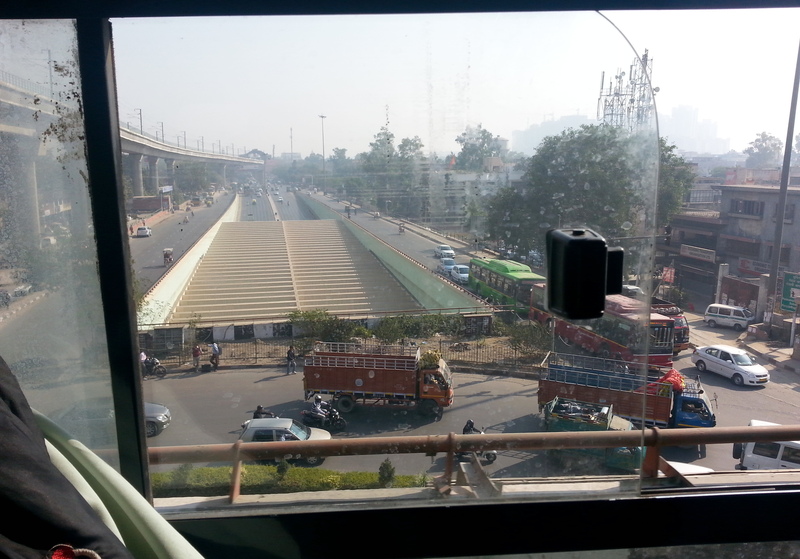 On the way till Shalimar Bagh, I thought that I have to go Straight only on Ring Road till Maya Puri Chowk, so why not take a bus, rather than an Auto. As it is, it’s been long that I have not been on a Bus. And so, Gurleen dropped me at Shalimar Bagh Bus Stand. Somehow I assumed that almost all the buses shall go straight till Mayapuri and hitched on to the bus which came as soon as I got down. While taking the ticket realized that it would not go to Maya Puri Chowk and hence got down immediately at the next Traffic Light and walked back towards the Bus Stand. Thankfully after 6 Buses drove by, a Bus came which would be going via Maya Puri Chowk. And I hopped on. Bas uske baad hum the…. Aas paas ka Mast nazara tha aur bahut Insights thi, which I absorbed, Clicked, Enjoyed and now sharing some. Delhi is Beautiful as it is, aur zara Upar se dekho to aur bhi khoobsurat hai. 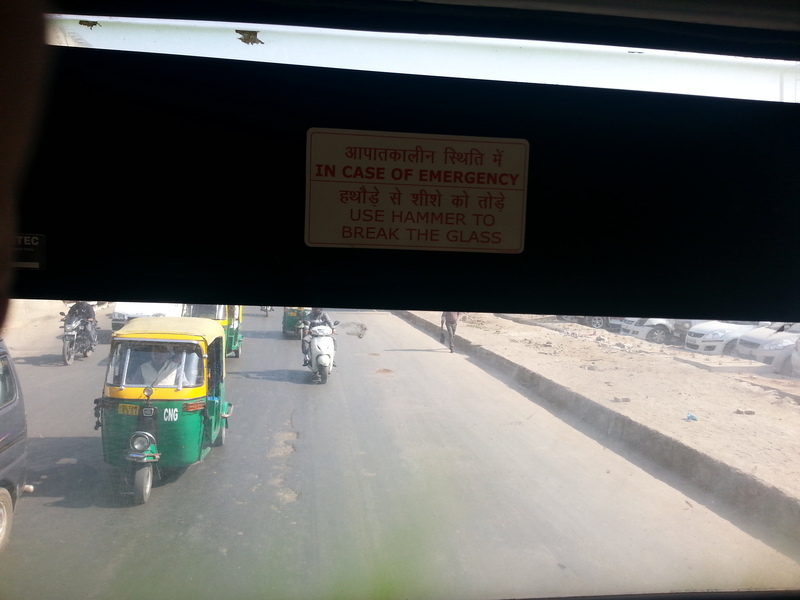 In this case a few feet above Ground, from a Bus. 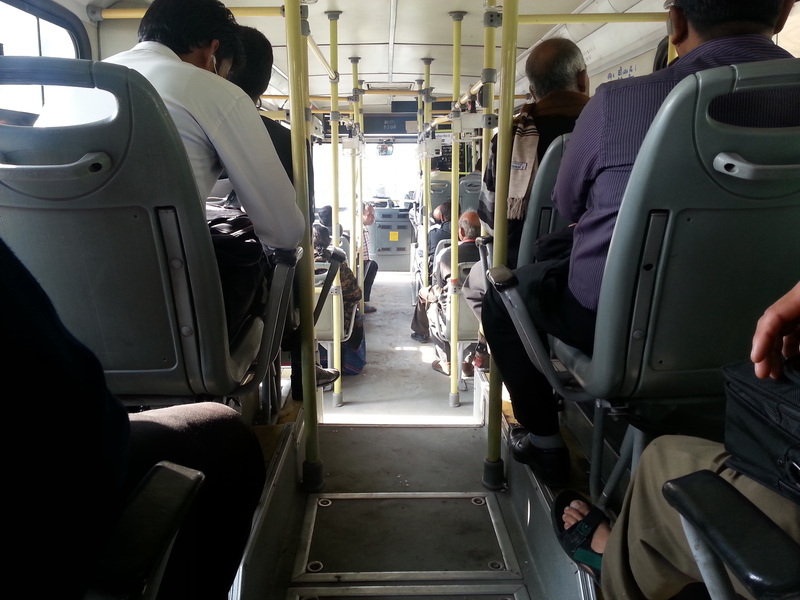 Some Things I noticed inside the bus…. The Conductor did his Job very well and was In Proper Crisp uniform. 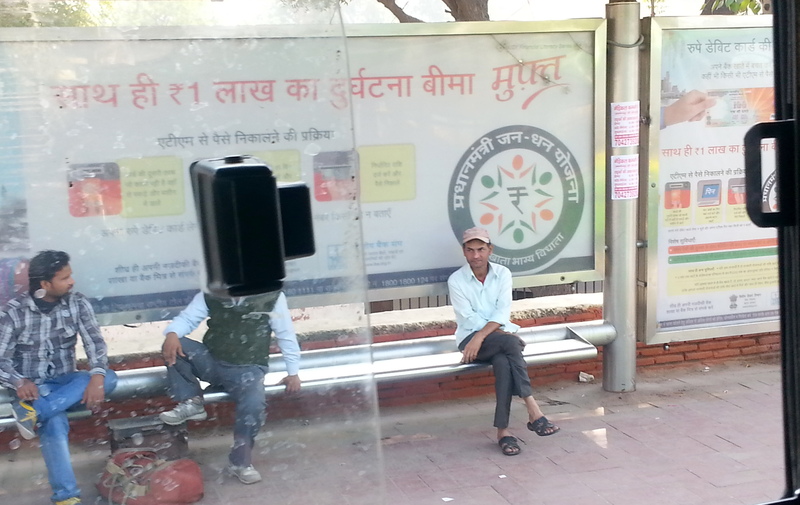 The Bus Stops are really Clean and Maintained well. Baithne ke liye saaf jagah mil jaye, wohi bahut hota hai. 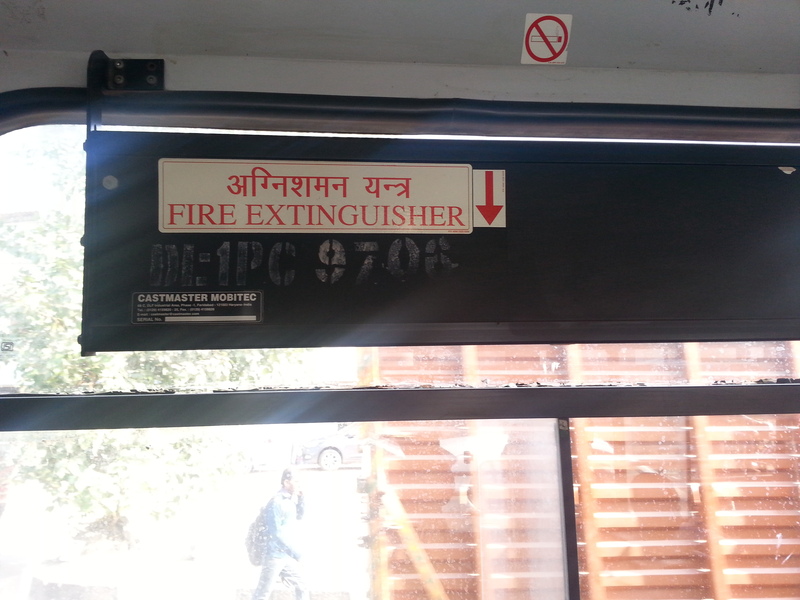 In case of Fire, The Bus does have a Fire Extinguisher. 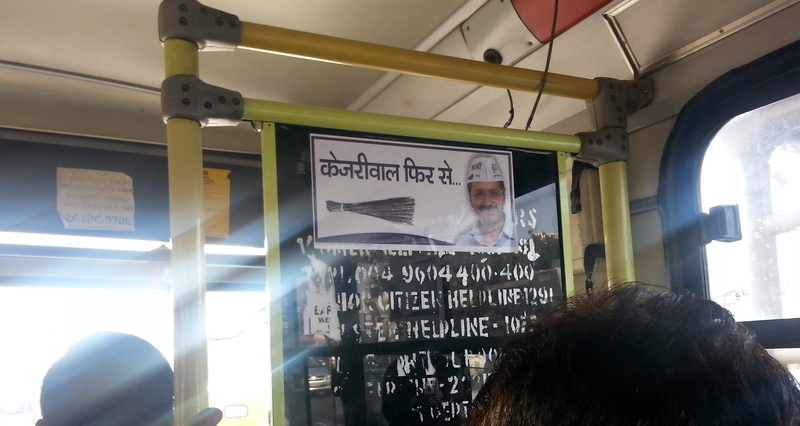 I saw this Poster of Arvind Kejriwal inside the bus. No, I don’t think it was Paid for to DTC. The City is Awesome, Down there was an Under Pass. 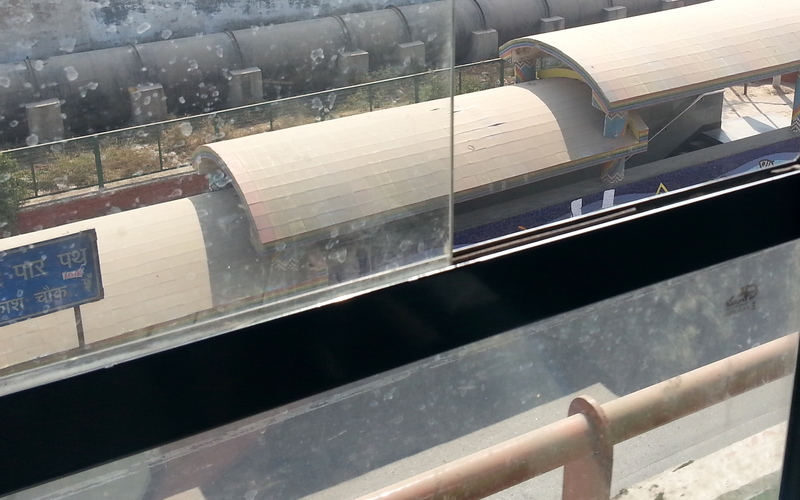 And on the Surface level was again a Road and On top of it, was a Flyover where I clicked this pic from a Bus and overhead there was Metro Train running. Four Levels!! I have shared some Experiences from 1995 when I used to travel a lot on DTC buses and have compared them with today’s experience. .
Today it was 50-2. Seems, Females Prefer the Safer Metro, even if the time taken is longer some times. Earlier The Conductor used to sit in the last and we used to first grab seats wherever we got, and passed a 5 Rs coin and asked some one ki Do rupye ki ek Ticket le dena and he would pass it to his piche wala. Today, It was same as far as snoozing is concerned. But today some people were snoozing while wearing ear phones. Good Way, Jab Gaana chal raha hai to masti ho rahi hai. And Gaana band ho jaye to headphones will cut the external chatter and shor. Thanks for reading through all this. I/m not sure, if you liked reading it. But if you did.. Then through some signal do let me know. It Shall add more Ink in my pen. The Ways to Signal are… By Liking the Post on Blog, Commenting on Blog, Sharing on Blog and Subscribing the Blog.